Linville Johnson, Bahamas Ministry of Tourism, Florida presents a prize trip for a lucky Florida winner to travel to Grand Bahama for the kickoff celebrations of The first ever Bahamas Junkanoo Carnival. Left to right: Don Wiggins, Eagle Reign Media; Lionel Lightbourne, winner; Geniar Hepburn, Belearia Ferry Express; “James T” Hot 105’s Radio Personality and Linville Johnson. 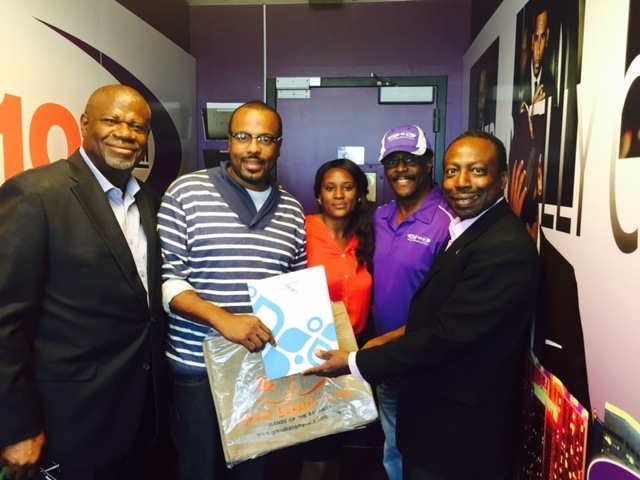 The Hot 105 FM Bahamas Junkanoo Carnival promotion was organized by Don Wiggins of Eagle Reign Media, with Mr. Linville Johnson, The Bahamas Tourist Office, Florida’s Director for the African American Market. The promotion, on Hot 105 FM featured Radio announcements and the contest for listeners to “Come Along” with the radio Personality for his live broadcast. The broadcast will take place from Freeport, Grand Bahama back to South Florida to an audience of an estimated 2 million, stretching from W. Palm Beach in the North to the Keys in the South. The Live Broadcast from Grand Bahama will focus on the myriad of events of what has been described as the “biggest non-stop cultural kickoff party the island has ever seen.” There will also be interviews, and prizes and Mr. Linville Johnson, representing The Island’s Of The Bahamas, will host the Broadcast. The Grand Bahama event this weekend will be the official kick-off to the Bahamas Junkanoo Carnival season and one of its main events will be The Music Masters concert. The concert will be a stage for top contemporary artists of The Bahamas to perform in competition. Twenty-five songs by nineteen artists and musicians have been identified through the first ever Bahamas Junkanoo Carnival Song Competition and will be performed April 17th and 18th 2015. The top ten songs from these semi-finals will then be performed in Nassau May 8th 2015. The festivities in Grand Bahama will also feature a Bahamas Junkanoo Carnival Beach Party, which will take place on Taino Beach in Freeport, featuring music, cuisine, dance and culture. A highlight of the weekend will be the Midnight Rush, early morning after-party for the Music Masters Concert. No costumes or organized lines will be needed, as it will be a massive street rush for spectators on the streets to participate in Junkanoo without the confines of competition . The Rushout will take place Saturday April 18th at 12:00 a.m. through 6:00 a.m.